Well At least it Didn’t rain! We had a lovely Trash or Treasure with about 20 homes putting out stuff and hundreds of people coming through to buy it. Ski suits going on the North side of Albert Square; wonderful crocheted blankets on the Eastern; cocktail dresses to take you to you the Ritz on a rather snazzy dapper and sophisticated Wilkinson street who did fabulous things – but only on one side of the street ! 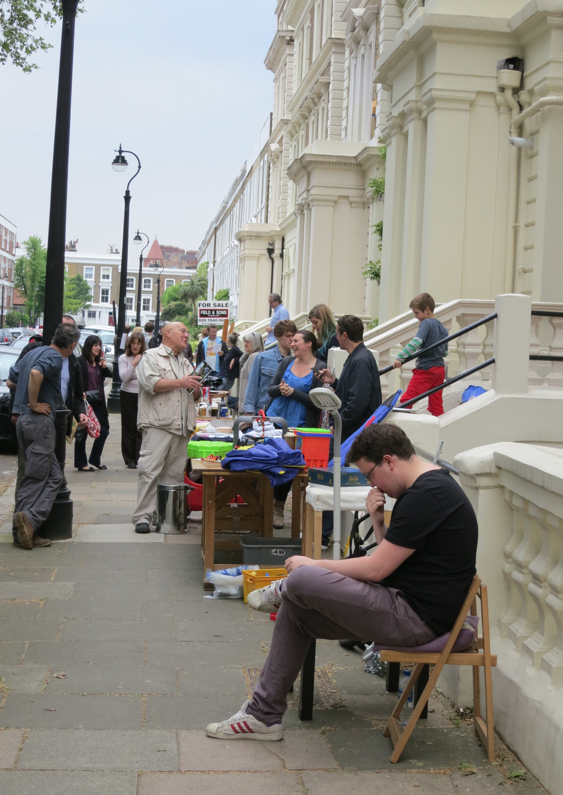 AND vintage paste + vintage golf clubs + all things charitable on ALdebert Terrace. Albert Square featured too West side had ONLY 2 good shows from residents with wonderful plates and glass. On the Eastern side – regrets remain for all those who cast their eyes on that that unbought iconic parmesan grater. Quality kids clothes going for 50 pence an item. Old and loved toys for 10 pence. Skates for £2 worn only 10 weeks before outgrown but costing new £140 – This is trash or Treasure. St Stephen’s rarely participates strongly as a street and this year was a total ZERO. ( Answers please on a post card from St Stephen’s occupants). Actually that is wrong. One lovely house left out diddy seed pots that we hope to recycle for the Jubilee Celebration with sunflower seeds – perfect size for a jubilee sunflower race). We hope that most people who came through the sale enjoyed it and felt that they left with a bargain. The reason for starting this event was to contribute to education re concept of recycling and avoiding land fill. We used to do a lot better on getting stalls in to talk about environmental input. We will try harder next time. Critically our aspiration is that the neighbourhood can catch up and chat and have a laugh. Importantly to make it safer because more people will know care and look after each other – and the kids will equally know and be known. We are very privileged to have an environment that many country villages would be thrilled with. Today was a lovely event – where those who made the effort to buy or sell probably left with a better feeling about our community. THANK YOU to all the wonderful people who made all the difference to the success of the day !